SW19 Osteopaths | What Is Osteopathy? Osteopathy is a primary, regulated health care system. It is complementary to other medical practices and is suitable for almost anyone. It can be used as a single therapy or to contribute to medical treatments and management in a wide range of conditions. Osteopaths are known to work with muscles joints and bones, but the work is often more complex, affecting the nervous system and metabolic systems such as the lymphatic system. Osteopaths always take a holistic and patient centred view, and gather relevant information and offer appropriate advice and encouragement. A biological fact and principle behind osteopathy, is that the body is an integrated and indivisible whole, and contains self-healing mechanisms that can be utilised as part of the treatment. No part of the body works, or can be considered, in isolation. Relevant psychological and social factors also form part of the process of diagnosis. Osteopathic diagnosis include listening to the patient's history, examining tissue quality, muscles and joints and observing movements. Other clinical investigations can also be used if required. After a diagnosis and treatment plan is formulated and agreed, a wide range of gentle, non-invasive manual techniques are applied therapeutically. Osteopaths will treat the whole person rather than just a specific condition - for example, an injury to your knee might also affect the foot, hip and spine. 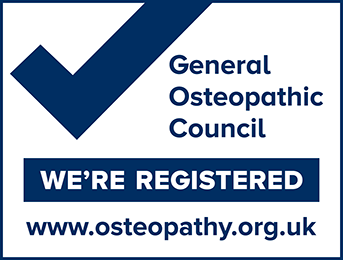 Osteopaths must be registered with the General Osteopathic Council in order to practice. Find out about the work we do to help adults, babies and children. Here there is information about the range of conditions that we can help, the therapies we are able to provide and how we work. Most of our patients find out about us from people who have already had treatment. We recognise the value of recommendation and always endeavour to give the best and most appropriate treatment.